18th June 2013 – Habitat Center, New Delhi. His Holiness the Karmapa’s new book was the talk of the town in Delhi, India this week, where it was officially released by the eminent social activist Aruna Roy. Entitled The Heart Is Noble: Changing the World from the Inside out, the book explores the most pressing issues of our day, including the environmental crisis, food justice and gender issues, arguing that each and every citizen of the world has a role to play in creating a better future for us all. 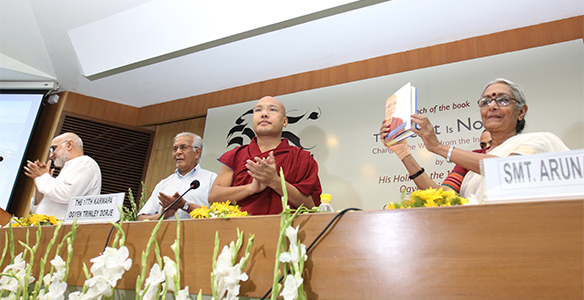 The book launch was standing-room-only at the India Habitat Centre, where such highly distinguished figures as Rajiv Mehrotra, Pavan K. Varma and Vandana Shiva also spoke in support of His Holiness the Karmapa’s approach to society as outlined in his new book. Speaking as chief guest at the book-launch event, Aruna Roy said, “As a social activist I was very excited to find that a person who is religious and who heads a religious institution should echo the words and feelings of people like me.” Aruna Roy has dedicated her life to working to eradicate poverty, and is one of India most respected voices speaking on behalf of the underprivileged. While Aruna Roy officially released the book as chief guest, Wajahat Habibullah (Chairperson of the National Commission on Minorities) was also present for the event, and was invited to the dais to assist in unveiling the book itself. His Holiness the Karmapa then discussed the major themes of his book. He pointed to the ethical implications of interdependence, which he says include a shared responsibility to work for social justice and environmental protection, based on all that we receive from society and the planet. The optimistic—though challenging message of the book—is that every single individual is responsible of changing the world for the better, and that even our small actions count and come together to make vast changes. At the same time, His Holiness reminds us that we already have within us sustainable inner resources for engaging in this work joyfully: our own noble aspirations and our capacity for compassion. Next in the illustrious panel of discussants was Pavan K. Varma, a distinguished diplomat and widely published author, renowned for his penetrating analysis of Indian identity and culture. He is currently cultural adviser to the Chief Minister of Bihar, Nitish Kumar. Varma-Ji’s comments were focused on the book’s success in leading readers from vague spirituality to feelings of compassion and from there to awareness and actual action. I mentioned before that we can make others the keepers of what is precious for us, when I spoke of wanting to let the moon keep my love. Since the moon is holding the love I have for you, seeing the moon can remind you of that, and inspire you. If anything I have said here makes sense to you, you can ask the moon to keep it for you. You can ask the stars to keep it for you. When you look at the moon and the stars, I hope you will be reminded of the thoughts and the love that I have shared with you here.